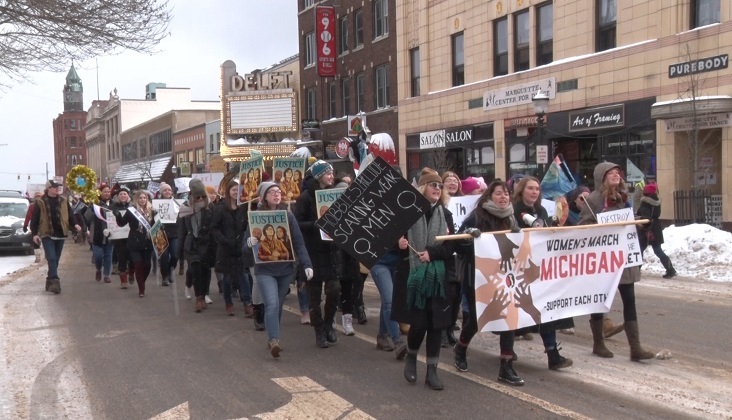 MARQUETTE — Despite the below freezing temperatures hundreds of people gathered in downtown Marquette for the 3rd annual Women’s March in solidarity for nationwide marches that are going on for Women’s rights. “Today is about a celebration of the women of this community, the women of our country and the women of the world. The record number of women that were seeing in government this year and even just running is really exciting. Today is also a day to air our grievances for the things that have been happening in this country to women since the beginning of time and currently,” said Chloe Gerathy, Promotions and Public Relations for the Women’s March. Those participating in the march say they have a full list of issues that they’re marching for. Many local organizations also joined the fight for women’s rights. “We got some local organizations inside the Marquette Commons who are tabling and spreading awareness for their causes. We got Planned Parenthood, the League of Women voters and U.P. Pride,” Gerathy added. After the march, participants gathered in front of the post office to hear from several speakers and ended their night at the Ore Dock to listen to live performances.